TRACKS and Farms at Work were delighted to welcome 16 Indigenous students from the Biishkaa orientation program, and 21 youth from the Adventures and Understanding program to the Flint Corn Community Project yesterday afternoon for a two hour introductory workshop. TRACKS staff member Dawn Martin discussed the history of the project, cultural traditions related to creation and the Three Sisters, pollination, soil, and symbiotic growing relationships. Over the three week Biishkaa program, students are acclimatized to both Trent University and Peterborough as a way of acknowledging that many of the youth are leaving their communities for the first time. Tutors and mentors are provided to the students, and they are introduced to the Elders in residence. As a way of immersing the students in their local Indigenous community outings to the Petroglyphs, Black Oak Savannah at Alderville First Nations, and Curve Lake also take place. Adventures and Understanding is a program of the Rotary Club in which Indigenous and non-Indigenous youth come together to share their cultures. 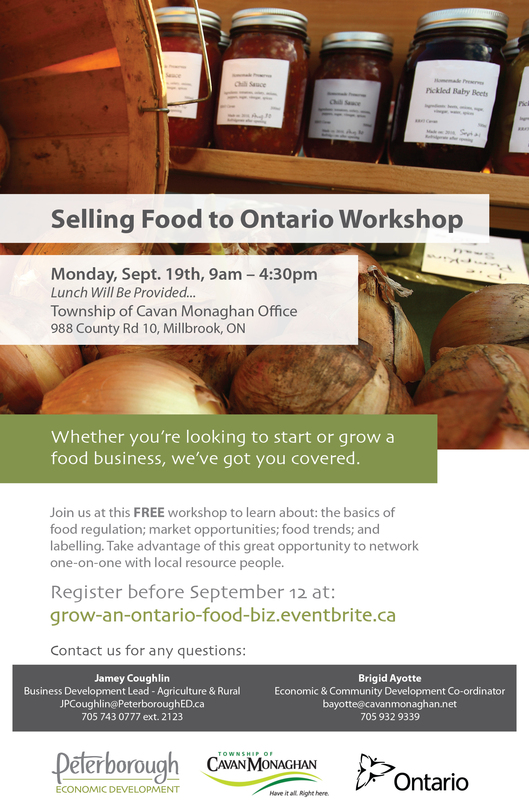 Selling Food to Ontario: Register Now! Local Food Month Officially Declared at the Peterborough Ex! Farms at Work is excited to be attending the 171st Peterborough Ex! At the opening ceremonies yesterday evening Farms at Work, along with our Local Food Month Peterborough partner Transition Town Peterborough, was proud to receive the Official Proclamation of Local Food Month. Come see us in the Innovate Ag Zone at the Memorial Centre to learn more about our Field Courses and other great resources for farmers. Also stop by the Gymnastics Building to find out how you can engage with Local Food Month, an excellent marketing opportunity for farmers in Peterborough County! For more information about Local Food Month, check out localfoodmonthptbo.ca. Stay in touch by connecting with Farms at Work and Local Food Month Peterborough on Facebook and Twitter! And don't forget to share your local food photos with the tag #localfoodptbo on Instagram. Visit www.peterboroughag.ca for the Peterborough Ex location and event information.